Bilişim Hukuku Günlüğü: How will we measure the internet of things? In writing about the plethora of startups, devices and strategies that companies large and small are throwing at the internet of things, I’ve been thinking about market size. Cisco says it will generate $14.4 trillion in profits by 2022. GE says it will add $10 trillion to $15 trillion in GDP by 2030. These numbers are hard to be believed. For example the federal government only brought in $2.45 trillion in tax revenue in 2012. But there’s also the question of how to measure the market or the value. Do we count the devices themselves? The dollars spent on platforms and services that tie connected devices together? What about subscriptions to wireless networks? In GE’s case it’s counting dollars saved by implementing better data gathering systems. But the whole idea of trying to measure what is fundamentally a technological shift as a market baffles me. There’s no question the internet of things is going to be big, but to separate the reality from the hype its worth looking for hard data. If not at market size or potential profits, then let’s just try to see where people are in terms of interest in the products. For example, check out these numbers from a March Yankee Group survey of about 2,300 people. That seems like a relatively small percent of the population planning on buying a new connected device in the next six months. And the numbers are somewhat odd, in that I don’t think even 5 percent of users are planning to buy a new smart meter –something utilities tend to provide. 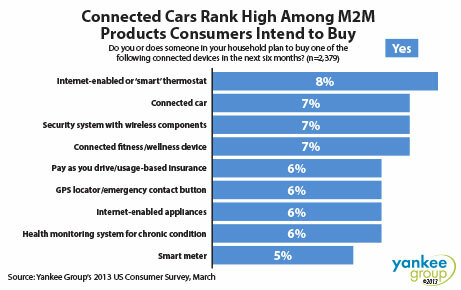 So I’m taking this data with a grain of salt, but I am looking for good ways to think about the market size and understand how rapidly people and companies are adopting connected devices into their homes and business processes. This is a real trend, but it’s clear we’re still at the beginning of the massively hyped shift that will lead to real value creation. I just don’t know how to measure how much.